Although this post is up after Halloween, I still hope you guys had a great All Hallows Eve! As you probably didn't know, Halloween just so happens to be my all time favorite holiday, so this year I really tried to go all out. Check out my costume highlights! This first costume of mine was the creepiest one out of all of my costumes. If you didn't know, I was The Chesire Cat from Alice and Wonderland! 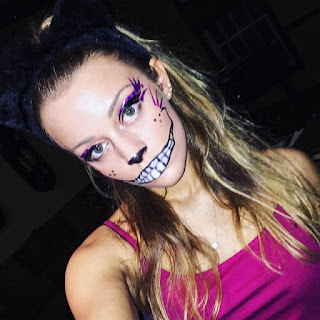 This was so much fun to dress up as, especially because of how awesome the makeup came out. I got the ears, face stickers, and face paint from Spirit Halloween. The tank top was from Forever 21, and I bought cheap black and white striped leggings from Walmart, cut them into shorts, and colored in the white stripes with purple Sharpie and viola! Chesire Cat colors :) I finished the costume off with purple striped leggings that were also from Spirit Halloween, and crawled around in my cute DIY costume. 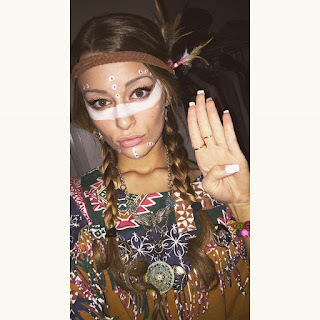 This next costume was one that I still got to paint my face for; I was a cute Indian the second night! This look was on the more casual side, so it was super comfortable to go out in. I got all of the components of my outfit from my dorm room, so this look cost me nothing! I found the headband underneath my bed, and the feathers from an old dream catcher I had. I borrowed the shirt and moccasins from my roommate, and wore ripped jeans. Talk about comfy. This last look was my absolute favorite- I'm still raving about it! I decided to be Ariana Grande as my third look :) I chose to be Ariana from the Problem music video, and Kate accompanied me as Iggy! We had so much fun dressing up as them for Halloween, and I love the way they turned out. I got both the dress and white boots from Amazon for a total of $50! That's pretty good considering how perfect the outfit came out. Be excited to see which Ariana I am for next year! Well, what'd you think?! Not too shabby, eh? I hope you guys enjoyed my three Halloween looks, because I know I enjoyed dressing up as them. Be on the lookout for my next post!